Greenville No. 1 singles player Natalie Milligan sends a serve across the net to her Fairborn opponent McKayla Lyons on Tuesday at the Greenville tennis courts. The Lady Wave won the match 5-0. Greenville’s Emily Marchal hits a return shot during her second singles match with Fairborn’s Tiana Thomas on Tuesday at the Greenville tennis courts. The Lady Wave won the match 5-0. Greenville’s Abby Swensen serves to her third singles opponent Melissa Le of Fairborn on Tuesday at the Greenville tennis courts. The Lady Wave won the match 5-0. 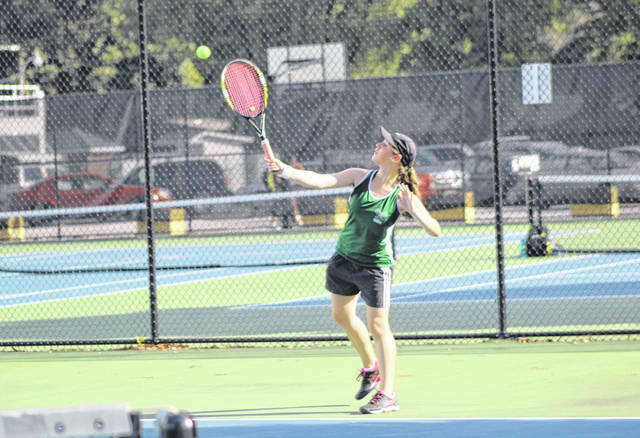 Greenville’s Abby Swensen hits a backhand during her third singles match with Fairborn’s Melissa Le on Tuesday at the Greenville tennis courts. The Lady Wave won the match 5-0. 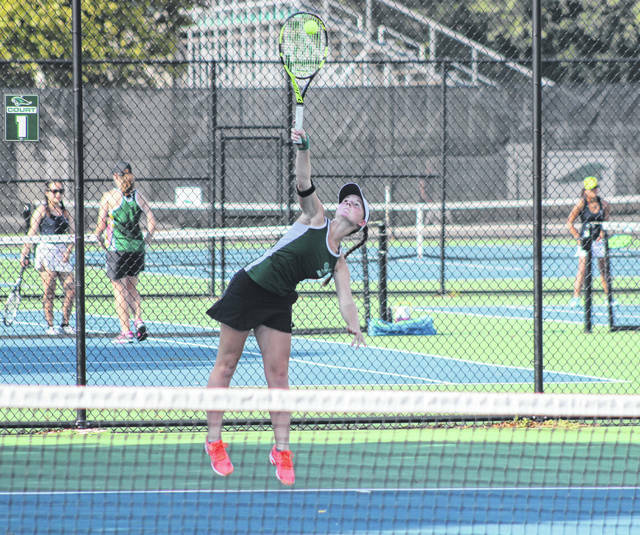 Greenville’s Natalie Milligan gets off the ground on this serve to her first singles opponent McKayla Lyons of Fairborn on Tuesday at the Greenville tennis courts. The Lady Wave won the match 5-0. 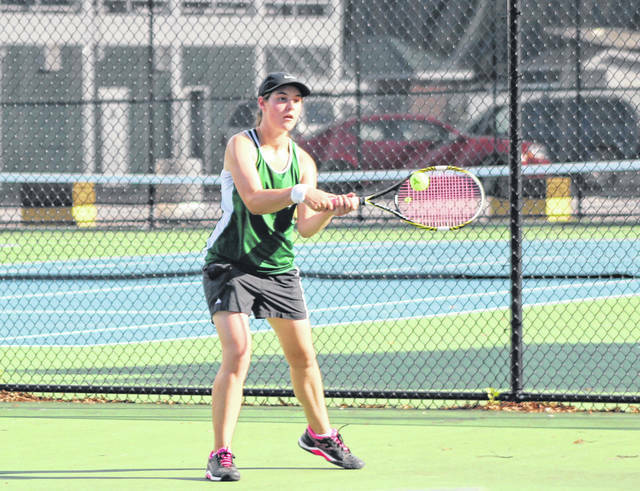 GREENVILLE – It was back to business on Tuesday for the Greenville girls tennis team after the long holiday weekend. 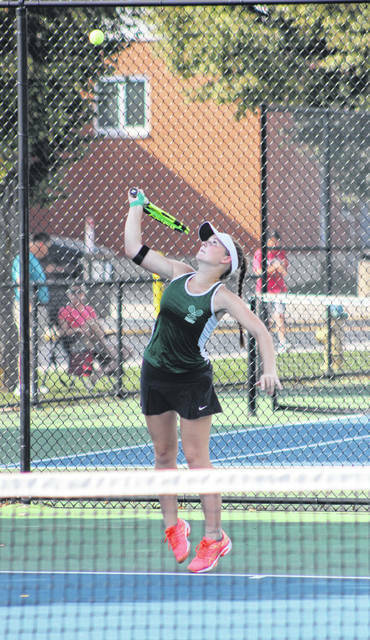 The Lady Wave hosted Fairborn in their first of three matches this week and wasted no time in taking care of the Skyhawks 5-0. In singles action, Natalie Milligan handled McKayla Lyons 6-0, 6-0 to improve to 5-2 on the season. It nearly was a 6-0, 6-0 sweep in singles play, but Emily Marchal’s second singles opponent Tiana Thomas did win one game to prevent the clean sweep. Marchal won over Thomas, 6-1, 6-0 to move her record to 3-2 at second singles. In third singles, Abby Swensen swept Melissa Le, 6-0, 6-0. On the doubles courts, Anna Manges and Marabelle Lance gave up only one game to their first doubles opponents Rita Chien and Caitlin Bowling in a 6-1, 6-0 victory. At second doubles, Felicity Lance and Faith Mansfield took care of Amanda Wilson and Katelyn Byczkowski 6-1, 6-1. Manges is a senior this year and moved to doubles after playing mostly at second singles a year ago. The Lady Wave have had to deal with some effects of Mother Nature this season to the tune of five rain outs thus far. Normally, this is the halfway point of the 20-match season, but at 6-2 in eight games the Lady Wave are just a little behind in their schedule. “We’ve had like five rain outs over the past couple of weeks,” Koontz said. “It hasn’t been too difficult to deal with. We just play it when we get to it. The rest of this week contains two more home matches for Greenville. Today, Sidney Lehman Catholic will visit followed by Troy on Thursday. “It wasn’t too difficult with the heat today,” Milligan said. “We prepared for it all summer long by practicing from 4 to 5:30 p.m. four times a week beginning the first week of June. 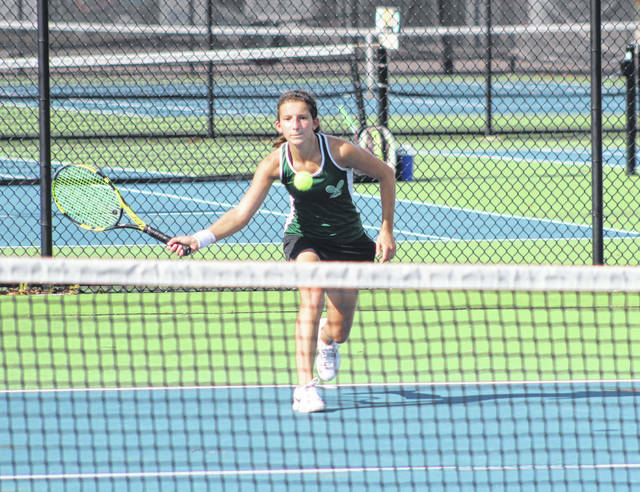 This entry was tagged Fairborn Skyhawks, Greenville girls tennis, GWOC, Lady Wave. Bookmark the permalink.